As a lifestyle television producer, former red carpet fashion reporter and beauty guru, I'm always looking for the latest/greatest thing when it comes to my skin care. With the Canadian climate currently in transition from summer to fall, it's time to talk summer skin recovery. As a lifestyle television producer, former red carpet fashion reporter and beauty guru, I'm always looking for the latest/greatest thing when it comes to my skin care. With the Canadian climate currently in transition from summer to fall, it's time to talk summer skin recovery. Armed with canuck-centric questions, I chatted with US Weekly's beauty director, Gwen Flamberg (@Gwen_USBeauty). I can't dive into our girlie-dishing interview, without talking credentials (and trust me, this woman's got the resume to back her beauty advice). Gwen's appeared on countless shows spreading her get-gorgeous gospel: from The Today Show, E! News and CNN Showbiz Tonight to Good Morning America, The Insider and Entertainment Tonight. So what's better than someone with her CV dishing all the dirt on top gossip shows --- um, how about sharing those celebrity-inspired summer skin recovery tips with Canadians, eh!? First up, I had to chat dreaded brown and red spots (this summer I got my first gigantic brown spot due to pregnancy hormones). ANGIE: What's the secret to repairing: (a) red spots (b) brown spots? GWEN: One great way to diminish the appearance of red spots and brown spots is by visiting a dermatologist for an in-office laser treatment like Fraxel. Pulsed light is able to reach the deeper layers of skin to help repair hyperpigmentation from sun damage. However, to maintain results, it's best to wait until autumn, when the sun is less intense and you're less apt to spend time outdoors. As an alternative to lasers, there are anti-aging skincare systems like Nerium International's Optimera Formula Day and night creams that are also clinically proven to combat discoloration and create smoother, more even skin. ANGIE: Do celebrities stick to an annual beauty routine or is it better to switch things up as season's change? GWEN: Stick to your regimen but add in products to combat the new season's issues. Your skin likes routine, but may need an extra boost. For instance, as the weather transitions from summer to fall, and the air becomes drier, add in a weekly mask to and a heavier cream to help nourish skin. As winter approaches and we have to combat cold temps and the drying effects of indoor heat, top your night cream with a facial oil to lock in moisturizing ingredients and help boost skin's barrier. ANGIE: Ok, expanding on the above, people often think that rotating skin care products will give better results -- is this true? GWEN: It is actually more effective to stick with a regimen that works for your skin. 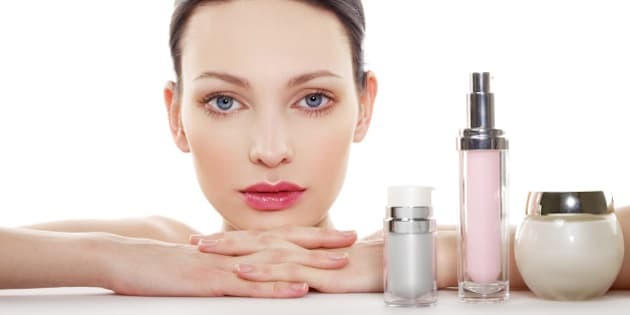 It takes at least six weeks for your skin to adjust to new active ingredients, though many people expect instant gratification, and then try to introduce too many new ingredients too quickly, which can result in inflammation (read: redness, dryness, itchiness and in a worst case scenario, a rash or breakout.) Your best bet is to rely on a systemic 24-hour regimen. If you need additional moisture throughout the year, or have a breakout that needs attention, fold in additional steps that target specific problems, while maintaining your tried and true regimen. ANGIE: A lot of us experience summer acne (brought on by excessive oils and lotions) -- help us!! GWEN: It's pretty simple really -- just up your cleansing game. For face, try "the double-wash." First, cleanse with an oil-based cleanser like the one by DHC. Oil is attracted to oil, helping to pull grease and grime out of pores; then use a micellar water cleanser, such as Crealine, to remove traces of oil on the skin. For the body, switch to a salicylic acid-packed body wash (Neutrogena makes a good one). Salicylic acid helps clear pores on the back and chest, which can get clogged due to waterproof sunscreens and sweat. ANGIE: When is the ideal time to focus on summer skin care repair? Is it an ongoing process throughout the summer or can people get started on it come the beginning of September? GWEN: If you stay true to your skincare regimen throughout the summer, you'll have less catch up to play. In addition to your systemic skincare routine, be sure to wear a sunscreen with an SPF 30 every day, to help prevent sun damage like brown spots. If you do get some hyperpigmentation, address it in September with the big guns -- lasers. If your skin texture is a bit dry following summer, add in a mask once a week to infuse moisture. ANGIE: I can't talk beauty without covering hair. I have an unruly, thick mane myself (thanks Italian roots) and could use all the advice you've got. Is there anything we should do to our hair to help with summer recovery? GWEN: Absolutely! Shampoo with a clarifying formula (Paul Mitchell's tea tree formula is amazing) to help remove drying salt from the ocean and all traces of chlorine from swimming in a pool. Both of these elements can alter color as they penetrate into the hair shaft. After cleansing, swap out your usual conditioner for a deep hair mask, such as Leonor Greyl's Masque Orchidee. Slather it on and then do your usual routine, allowing it to sink in for 3 minutes in the steamy shower. A deep treatment infuses each hair shaft with nourishing ingredients to help restore health and shine. After rinsing, let your hair air dry. ANGIE: Gwen, you're amazing. Thanks for taking the time to talk Canadian beauty issues. For more tips from Gwen, including the do's and don'ts of travel beauty routines, visit my website; www.familytravelguide.ca and follow the conversation on twitter: @bumbalina & @Gwen_USBeauty.